Republic of Ireland international midfielder Stephen McPhail witnessed it all at Leeds United and to this day the club holds a special place in his heart. “I had many offers as a youngster but following trials at Nottingham Forest and Arsenal, I was invited to spend a week at Leeds under the watchful eyes of Paul Hart and Eddie Gray. I enjoyed it in Yorkshire and felt comfortable. “We would be in at 8am and wouldn’t leave until 6pm. We had jobs to do around the ground before going out to training. We would have to clean the toilets and other areas. Paul Hart was meticulous and if he found any dirt or dust we would have to start again. “We would be asked to keep the first year pro’s in check and we would inspect their jobs before the coaches did. Warren Feeney had joined the club, he was a good lad but he was very chirpy, always answering back and having the last word. “Any apprentice caught doing anything untoward would be summoned to ‘court’ and appropriate punishment would be dished out. “We were training at Thorp Arch even though there was lots of building work going on. We’d had enough of Warren and it was decided that he would be punished by the ‘court’. 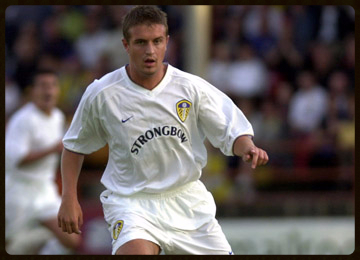 After some impressive displays for the reserves, Stephen McPhail made his Leeds United debut as a substitute on the 7th of February 1998 away at Leicester City and went on to make three more appearances from the bench before the curtain came down on the campaign. “On the day before the Leicester away game, I knew I was in the squad and although I was naturally delighted, I was nervous. You look around the dressing room at the star names and you realise that more is expected of you and I felt that I was away from my comfort zone. Gary Kelly was brilliant with me and him more than anyone helped me settle in and feel part of the set up. “We didn’t think he would go, especially with his strong Arsenal connections. It was a huge blow when he left and when any manager leaves, players go through a period of uncertainty. “It was heartbreaking and that game should never have been played. At the end of the day, a game of football was the last thing on our minds and the result was irrelevant. Whilst speaking to Stephen about the tragedy, I could sense a change in his tone and he pointed out that he is still deeply affected by what happened over in Turkey and like all of us, he will never forget the memory of Christopher Loftus and Kevin Speight. "We won 2-0 that day, in front of the cameras and I was lucky enough to grab both goals, my first goals for the club. “The first one came when I was on hand to place a shot into the back of the net following a pass from Lee Bowyer. All the lads dived on me and Gary Kelly came running over and dived over everyone who was laid on the floor. “There were problems and it’s well documented that the manager started to lose the dressing room, although it is hard to keep a big squad happy and some of the stuff thrown at David O’Leary was unfair. Thank you to Stephen McPhail for his time and giving me the opportunity to write this article.